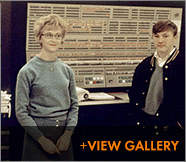 Mainframe computers that filled huge rooms; ALGOL, the algebraic computer language known to cause migraines; 11 p.m.—often the only time available to use the lab. Susan Boyd remembers what taking computer classes meant at Northwestern in the mid-1960s. There was no major in computer science then. Learning to use the electronic beasts was not for the faint of heart, but Boyd, a math major, found them exciting. Then a summer job in banking between junior and senior year convinced her that computers were her future. And right after graduation in 1965, Boyd became an IBM systems engineer like Marcia. At the time, she says, companies didn’t assume you had any kind of computer training and Boyd took several sessions of six-week classes. She was one of four women in a class of sixty, having been encouraged early on to follow her interests by her father, an electrical engineer. Her timing couldn’t have been better as she started work at IBM’s office in Pittsburgh, her hometown. Two months prior to her hiring, the company introduced its System/360, a line of products that varied in size and performance capabilities, she recalls, but operated on the same set of commands. Unlike other systems, it allowed customers to order a lower cost model and then upgrade as their needs grew, without the time and expense of writing new software. This was a radical innovation at the time. Systems engineers were the technical arm of the sales force and Boyd’s main customer was Gulf Oil’s research center, which harnessed the new technology to find promising locales for the exploration of oil fields. “Their mainframes filled a room the size of a warehouse,” she recalls. “We had huge printers that did volumes of print, most of it driven off of tape drives, which used big reels of magnetic tape. Loading the reels was a very laborious process that required hours and sometimes days. Some of the early computers were water-cooled, so you had to have raised floors because of all the cables and air-conditioning. She stayed with IBM throughout her career, moving seven times, and holding positions such as regional industry marketing representative, marketing manager, and manager of ordering systems. In retirement these days, she enjoys close relationships with the friends she made freshman and sophomore years in Allison Hall, and later, as a member of Delta Zeta sorority. The computer pioneer—who can’t wait to buy a Kindle 2 to read mystery novels—marvels at the ever-increasing miniaturization and memory that distinguishes today’s machines from their ancestors. “In my little laptop, I have hundreds of times the storage capacity that we had in a roomful of machines,” she says. Still, when she runs into serious computer trouble? “I have to call tech support, like everybody else,” she says with a laugh. From a vantage point of almost 30 years, it was a great idea for Tim Krauskopf to major in the Integrated Science Program (ISP) at Northwestern. The honors courses immerse students with high math aptitude in all the natural sciences. It was excellent preparation, Krauskopf says, for what came next: groundbreaking work at the fledgling National Center for Supercomputing Applications (NCSA) at the University of Illinois at Urbana-Champaign. His timing was fortuitous. Krauskopf went to UIUC for a master’s degree in computer science in 1986, the same year that the university and the National Science Foundation were launching NCSA. Its mission was to give leading-edge scientists access to the fastest supercomputers in the world. But the machines produced so much data from simulations and calculations that scientists also needed faster network connections and new software for their desktop computers. This is where Krauskopf and his group came in. Thanks to ISP at Northwestern, he says, he understood the scientists’ language and their needs for graphics and networking tools. He points out that a class project at Northwestern—creating a computer simulation of an electron cloud—was just the sort of work enhanced by the Center’s research. He became the original author of NCSA Telnet, which was his master’s thesis topic. It was a program to connect PCs and Macintosh computers to the NCSA supercomputer. Because it could also connect desktops to mini-computers and mainframes, it quickly spread across the country and brought NCSA to the attention of the entire scientific community. At the time, NCSA’s products were available to everyone free of charge, for non-commercial use. Krauskopf left NCSA in 1990 to co-found Spyglass, Inc., to create commercial versions of NCSA’s products. “The university was not set up to drive technology into the marketplace,” Krauskopf explains. “They became good at giving away software, but it’s a different operation to sell it and then work on features that are boring from a research viewpoint.... One of the first things we worked on was a print command,” Krauskopf recalls. Spyglass put new names on NCSA graphics software and added many features. Spyglass Transform, data visualization software primarily for scientists and engineers, won a MacUser Eddy Award in 1991. In the meantime, back at NCSA, Marc Andreessen and Eric Bina (brother of Weinberg associate dean Craig Bina) were busy creating Mosaic, which would become the world’s first popular graphical web browser. Mosaic would give Internet users easy access to multimedia sources of information and, in the process, transform the exchange of information worldwide. In 1994, Spyglass became UIUC’s commercial partner to bring Mosaic to the public. In 1995, Microsoft licensed Spyglass Mosaic for $2 million (later, they paid an additional $8 million) modified it, and renamed it Internet Explorer. The rest is history. Krauskopf’s career has taken some fascinating turns since then. While information technology director for Chicago’s Field Museum, he earned an MBA from Kellogg School of Management. He worked at two start-up companies which didn’t take off and joined Motorola as a vice president. In his year and a half with the firm, he assisted in bringing Internet software applications to cell phones. “At that point, in 2001, tech was in the doldrums,” he points out. In preparation for Y2K, anyone who needed a new computer system had already purchased one; then came the terrorist attacks of 9-11, precipitating more economic slowdown. Leaving Motorola and ready for a big change, he followed a childhood interest and learned to drive a semi-trailer truck. He traded his white collar for blue overnight. That led to starting his own trucking company, Round Lake Freight, which he later sold, though he remained their CFO for a time. His two main career threads—computers and trucking—came together when he opened a website technology company to improve the efficiency of commercial freight. With his broad science background, early software innovations, and novel applications of computer science to transportation, Krauskopf is in a good position to give advice. For graduates just starting out, he is asked, is there still a technology frontier to conquer? Building a Better Search Engine? At 15, Rich Skrenta wrote the first wide-spread microcomputer virus, the Elk Cloner. As a Northwestern sophomore, he invented a computer game beloved by many. As an adult, he co-founded the online news site Topix. And now, at age 42, he is attempting something reminiscent of David v. Goliath: building a search engine to challenge Google. Normally, an 11-person team and an initial $2 million in funding would draw chuckles from industry pundits. But people take Skrenta seriously when he says he will have a product to show in six months. It wouldn’t be the first time he has taken on a huge challenge and won. He grew up in Pittsburgh, with his mother a nurse and father a surgeon. Watching his dad sew a finger back on a man after a circular saw accident was enough to make young Rich faint. He vowed to go into a “dry” rather than a “wet” profession: computer science rather than surgery. What he did next nearly marked him as a cyber villain for all time, innocent though his intentions were. In 9th grade, he took a pirated computer game (there was lots of pirating in those days, he says) and decided to play a trick on his friends. “I altered the boot section on the disk, so when you started the game up, it would count how many times the game had been booted. When you got to the 10th time, the disk would be deleted and a talking message would come up.” The booby-trapped game did its job of frustrating its players who now knew to keep Rich away from their disks. So he went one step further. He loaded some altered software into the Apple II computer in the school lab; when the next person used it, the software would infect their disk and propagate. It spread like a virus to disk after disk, computer after computer. The prank led to a mention in Scientific American for the high school student. He thinks he included that fact in his Northwestern application. At the University, the boy who had taught himself computer languages now struggled with Spanish and switched to Mandarin. He remembers fondly Irene Pepperberg, visiting professor in anthropology, and her class on communicating with Grey parrots, especially her famous parrot, Alex. (His obituary was in The Economist two years ago.) Already well-versed in technology, Skrenta wanted to pursue the subjects he didn’t know much about—literature, history, art history. And he wanted to write another computer game. “There were basically two big computers inside Vogelback Computing Center [a Control Data Cyber mainframe and a Digital Equipment Corporation VAX],” he remembers. “Terminals all over campus connected to them. You could type a command to see who was logged in. There were crude tools to communicate with people; there was e-mail. He became obsessed with coding the game, “Monster,” during winter quarter, 1988. He’d stay up all night in Vogelback, missing classes to sleep during the day. The game, primitive by today’s standards, had no graphics, only text: “So and so comes into the room; so and so punches you; so and so hit Bob with a sword,” as he describes it. Around the time it became popular—he sent it out on the Bitnet—Skrenta let other players add their own creative flourishes to the game and bowed out. Exhausted, he decided to stay in school and study. It was in the Tech subbasement, the other building with a computer lab at the time, that he met his future wife, Heidi Michelle Egronin, class of ’88. Luckily, Heidi, now an immunologist, needed help with her computer homework and Skrenta was only too happy to oblige. After graduation and a few East Coast computer jobs, the couple headed west to Silicon Valley. While at Sun Microsystems, Skrenta worked on a side project of his own—a web directory—which he sold to Netscape six months later. It became known as the Open Directory Project. They aggregated news from thousands of sources: breaking news stories and blog posts, press releases and information on government news sites. They used artificial intelligence algorithms to scan the stories, figure out their content, and categorize them into one or more of 360,000 news pages. Each zip code had its own page, as did 5,000 public companies, 48,000 celebrities and 1,500 sports teams. Soon millions of people were visiting the Topix site. Because everyone had a specific reason to view a page—based on interests, home address, career information, etc.—audiences were targeted in a way desirable to advertisers. The team, who had self-funded the company, found they could charge above-average ad rates for space on the pages. Within a year, they were paying themselves salaries. Within three years, they sold Topix to three news chains: the Tribune Company, Gannett and Knight Ridder. And the site is still growing. With Skrenta’s track record, expectations are high regarding his possible rival to Google. While details are necessarily secret, the computer guru points out that much has changed in the 10 years since Google began. “The Web was a billion pages in 1998. Now it’s probably one hundred billion, if not more,” he says. “With so much data to mine, there are different experiences and different views we can provide to people. Understanding the semantic content of text documents is a fertile area to research. I am sure we are going to come up with new techniques, lots of new stuff.” The excitement of a boy about to take a radio apart remains fresh in his voice.